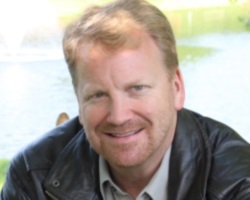 Awhile back, when Bill Gaither was visiting Feek Farm, the charming home of artists and friends Joey + Rory in tiny Pottsville, Tennessee, 45 minutes south of Nashville, he had an epiphany — one that turned out to be as right as rain on the roof of the farm’s barn-turned-concert-hall/studio. That first look eventually led to the taping of the Gaither Vocal Band’s newest DVD, Sometimes It Takes a Mountain, featuring songs from the CD of the same name released in 2014, in Feek Farm’s rustically high-tech environs. What’s more, the taping before a live audience of Homecoming artists and friends ended up so rich — with an abundance o of classic tunes and special guests — that a second CD and DVD, Happy Rhythm, emerged as well. “All of this starts with a song,” says Gaither, noting the resonant lyrics, melodies and peak vocal performances within the music. And yet, the rural barn also added to the mystique. “We wanted to find a warm, cozy setting,” he continues, reflecting on the variety of venues in which the GVB has performed both live and for video. 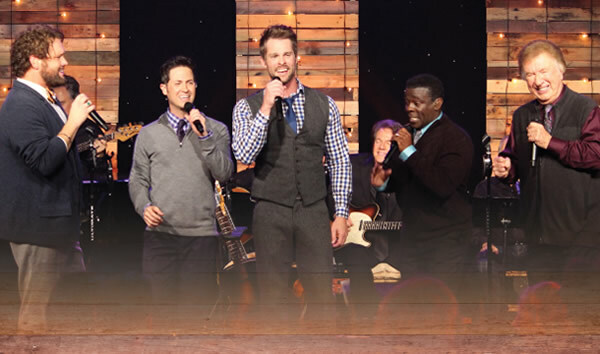 Adding to the DVDs’ uniqueness: They’re the first recorded with the band’s most recent additions, lead singer Adam Crabb and baritone Todd Suttles, both of whom shine on numbers that showcase their distinctive sounds as they mesh with Gaither, Wes Hampton and David Phelps. 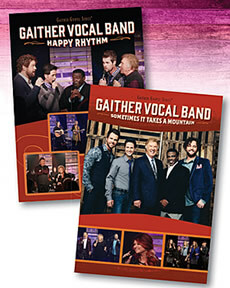 Produced by Gaither and Phelps, along with Ben Isaacs, the DVDs also benefit from an all-star cast of instrumentalists — Kevin Williams, Greg Ritchie, Ben Isaacs, Wesley Pritchard, Kevin Moore, Matthew Holt and a few surprise guests — along with the famed Voices of Lee choir from Lee University in Cleveland, Tennessee, and a live orchestra composed of violin, viola, cello, trumpet, trombone, ute and piccolo. Throw in a who’s-who of guest players and vocalists on many of the 34 songs performed that night — the Nelons, the Isaacs, Charlotte Ritchie, the Martins, Goodman Revival, Buddy Greene, Gene McDonald and more — and the result is a stirring, Spirit-lled celebration. In addition, the DVDs feature entertaining vignettes from the GVB’s visit to nearby Marcy Jo’s Mealhouse and Bakery — a down-home café opened by Joey and her sister-in-law, Marcy (Rory’s younger sister) — and insightful, behind-the-scenes interviews in which Bill Gaither chats with friends and artists. In her inimitable style, Gloria Gaither wrapped a bow around the taping by speaking heartfelt words of hope in the midst of pain and loss — words that provide a fitting capstone to the songs raised to the barn’s rafters and beyond. With words and songs like these, the path to freedom is all the sweeter.